THE Algonquian family occupied formerly a more extended .area than any other in North America. Of the several divisions, geographically, the northern is the most extensive, stretching from the extreme north-west of the Algonquian area to the extreme east, chiefly north of the St. Lawrence and the Great Lakes, including the Chippewa-a popular adaptation of Ojibway-group, which embraces the Cree(? ), the Ottawa, the Chippewa, and the Missisauga; the Algonkin group, comprising the Nipissing, the Temiscaming, the Abittibi, and the Algonkin. The north-eastern division embraces the tribes inhabiting Quebec, the Maritime provinces, and the State of Maine. Here we find the Micmac belonging to the Abnaki group. The western division comprises three groups dwelling along the eastern slope of the Rocky Mountains, the Blackfoot Confederacy, the Arapaho, and the Cheyenne. The Sault Ste Marie Mission at Garden River was begun between 1831 and 1833 by the Rev. William McMurray (1810-1894). A church was built by the Government. A few years later he was obliged to retire on account of ill-health. The mission then passed into the hands of the Rev. Frederick Augustus O’Meara, who ministered to the Indians at Garden River until 1841, when he was removed to Grand Manitoulin Island, in Lake Huron. Here the Canadian Government endeavoured to concentrate the neighbouring Indians in 1840 and 1841, after the mission at the south end of Lake Superior had been discontinued. O’Meara was born in Dublin, Ireland, and obtained his. master’s degree from Trinity College, Dublin. Shortly after his ordination he answered a call made by the bishop of Dublin for young men to do missionary work in what was then Upper Canada. After a year or two as travelling missionary he was asked to take charge of the Indians on the Georgean Bay and Lake Huron generally. For a year he lived at the Sault Ste Marie. At the request of the late Bishop Strahan and the Governor of Canada he accepted the position of Government chaplain to the Indians on Grand Manitoulin Island and remained there a little over twenty-one years. The work in his new field was richly blessed. His services to the Church in his different translations of the Prayer Book and of portions of the Bible, with his untiring labours among the Indians received high commendation from the bishop of Toronto. * Shahguhnahshe | Ahnuhmeähwine Muzzeneēgun | Ojibwag anwawaud azheühnekenootah- | beēgahdag. | Toronto: printed by Henry Rowsell, | for the Venerable Society for Promoting Christian Knowledge. | London. | MDCCCLIII. A literal translation of this Chippewa title, according to Pilling, is: English | Prayer Book | the - Chippewas, as their language - is so - translated - and - put - | in - writing. Title, reverse blank. The text, in roman letters, is entirely in Ojibwa, except English and Latin headings. It occupies pp. 3-272, i-ccclvi; page, 3¼ x 6¼; paper, 4½ x 7¾ inches. Of the pages, numbered with roman numerals, pp. i-cxx contain the Administration of the Sacraments: Ewh kechetwah Shahkuhmoonengawin. Pp. cxxi-cccxxx the Psalms. or Psalter of David: Oodahnuhmeahwine Nuhguhmoowinun owh David, i.e. literally translated: His - religion songs that David. Then follow on pp. cccxxvii-ccclvi Nuhguhmoovinun, i.e. songs or hymns. A most interesting account of the work of this mission is found in James Beaven, Recreations of a Long Vacation, or a Visit to Indian Missions in Upper Canada, London, 1846; 196 pp. ; illustrations; small 8vo. Another edition was published in 1883(?) 1-643 pages; colophon, p. (644), 12mo. In this edition the Benedicite Omnia Opera and the Athanasian Creed are omitted. Dr. O’Meara translated also the whole New Testament. parts of the Old; Hymns; and wrote several other tracts in the Ojibwa language. After a faithful service of a little over twenty-one years at Manitowaning, on Manitoulin Island, it became evident to O’Meara that the English Government was about to hand over the charge of the Indians to the Canadian Government and that the latter would abandon the establishment at Manitowaning. Consequently he resigned and accepted an appointment in the Diocese of Toronto. For five years he was in charge of the United Missions of Georgetown. Stewarttown and Norval; and was then called to the rectorate at Fort Hope, Ontario, which he held at the time of his decease in December, 1888. In his work of translation, Dr. O’Meara found that while there were certain scriptural terms peculiar to the Orient which had to receive a somewhat peculiar rendition, such as Wigwam for Tabernacle, there was not a single thought or fact that could not be faithfully conveyed to the Indian mind in its own tongue. The information concerning Dr. O’Meara has been obtained from his eldest son, the Rev. C. O’Meara, Trinity Rectory, Monroe, Michigan. — (Letter of February 19, 1912.) . In 1875 the Indian Commission of the Protestant Episcopal Church at New York published: Mizi anamiawinun | Anamie-Muzinaigun | Wejibwenissing | Wejibwemodjig | tchi abadjitowad. Title one leaf, reverse blank; text, pp.1-101, 24mo; entirely in the Chippewa language. This service book was used at the Indian Church of St. Columba, White Earth, Minnesota. It was revised from Dr. O’Meara’s translation, by the Rev. Joseph Alexander Gilfillan, with the aid of three half-breeds — Paul Beaulieu, Truman A. Warren, and François Bellair. Griffiths 129:4; Griffiths considers this to be the Ojibwa language. Pp. 1-72 contain the portions of the Book of Common Prayer; 73-101 hymns. Two later editions were pubblished, one in 1886 reading: Anamie-muzinaigun | Wejibuewising | Wejibuemodjig | chi abadjitowad. | Ka-ajanaangag, | 1886. English imprint; Detroit, Minnesota. | The Record Steam Printing Office | 1886. Title, reverse blank; text, pp. 1-148. 18mo. Prayers, pp. 1-74; hymns (with half-title Nagumowinun), pp. 75-148. Most of these hymns were from the collections of the Revs. Peter Jones, James Evans and George Henry, though a few are original translations. A reprint, with corrections and additions, of this 1886 edition appeared from the same press in 1895. 130 pages. Pp. 59-130 contain the collection of hymns, 87 in all. “ ... I had gone to the Reservation in June, 1873, sent there by the Bishop, and as there were only a very few copies of Dr. O’Meara’s large Prayer Book to be had and many of the expressions in it were not Ojibway, it was necessary to have a smaller, handy book, containing only the parts in daily use. . . . I got T. A. Warren, the Government interpreter, a leading half-breed, Paul H. Beaulieu, and also, part of the time, Rev. En-me-ga-bouh or John Johnson (an Ottawa by birth), the Ojibway clergyman (died 1902) in charge of the local congregation. . . . To these I read sentence by sentence those parts of Dr. O’Meara’s large Prayer Book which we wished to translate. . . . In cases of doubt recourse was had to a full-blood Ojibway, Ki-chi-bi-ne, ‘The Big Partridge.’”. In the 1895 edition Dr. Gilfillan was assisted by the Rev. George B. Morgan, a born Chippewa, and by his brother, a layman. Dr. Gilfillan has had the superintendence of all the missionary work of the American Episcopal Church among the Chippewa in Minnesota; his circuit covering an area of nearly three hundred miles in the northern, sparsely inhabited region of the State, and including eight Indian churches, presided over by eight full-blood Chippewa clergymen. Nine full·blood Indian clergymen were trained and presented for ordination by him. In the fall of 1888 he built four boarding schools — one at Wild Rice River, another at Pine Point, the third at Leech Lake, and the fourth at Cass Lake. Warren was a lineal descendant of the brother of General Warren, of Bunker Hill fame. His grandfather came from New England as a fur-trader and married an Ojibway woman. Beaulieu was also a mixed-blood of the famous French family of the Leroy-Beaulieus. He was a very eloquent man, with a great gift of language. Most of the half-breeds on the Reservation were descendants of French voyageurs and fur-traders. The latest Chippewa translation of the American Prayer Book appeared in 1911, entitled: . 280 pages. Paper, 3⅝ x 5½ inches. Title, reverse blank; text, pp. 3-280. P. 3 contains an explanatory note concerning the dash beneath letters which has the force of “ng.” P. 4, blank; p. 5 has the certificate of the bishop, etc. The Prayer Book extends from pp. 7-212, printed in long lines. Headings, subheadings, running headlines and rubrics are in English only. Contents: Morning Prayer, pp. 7-24; Evening Prayer, 25-38; Litany, 39-49; Prayers and Thanksgivings, 50-58; Collects, Epistles and Gospels, 59-102; Holy Communion, 103-129; Baptism of Infants, 130-146; Baptism to such as are of Riper Years, 147-158 ; Catechism, 159-166; Confirmation, 167-171; Matrimony, 172-177; Communion of the Sick, 178-179; Burial, 180-188; Prayer and Thanksgiving for Harvest, 189-191; selections of Psalms, 192-204; Family Prayers, 205-212. Pp. 213-280 contain Ojibwa Hymnal, compiled by Rev. Edward C. Kah-O-Sed . . . 1910. Title, p. 213; 214 blank; 68 hymns and doxology, pp. 215-276. Pp. 276-280 English index and Ojibwa index of hymns. The translator and editor of this edition, the Rev. Edward Coley Kah-O-Sed, was born on Walpole Island, Ontario, Canada, September 30, 1870, the son of Christian parents. In 1894 he came to Minnesota as an interpreter for a missionary at Red Lake, Indian Reservation. In 1896 he went to Seabury Hall, Faribault, Minnesota, and graduated there in 1900. Since 1905 he has been stationed at Beaulieu, Minnesota. He was ordained priest in 1907 by the Right Rev. James Dow Morrison, bishop of Duluth. The 1895 edition of Dr. Gilfillan, having been exhausted by this time, Mr. Kah-O-Sed prepared the edition, just described. A copy of the 1911 translation was sent to me by Archdeacon Heman Franklin Parshall, of Cass Lake, Minn., through whose kindness | obtained from the Rev. Kah-O-Sed the biographical data given above. Another translation of the English Liturgy for the benefit of Chippewa Indians in Canada remains to be mentioned. In 1880, and again in 1881, the S.P.C.K. published the Book of Common Prayer and Administration of the Sacraments. . . . 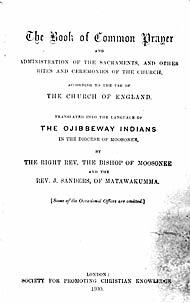 Translated into the language of the Ojibbeway Indians in the Diocese of Moosonee, by the Right Rev. the Bishop of Moosonee and the Rev. J. Sanders, of Matawakumma. (Some of the occasional offices are omitted) . . . 152 pages. Paper, 4 x 6½ inches. Title, reverse printer’s name; text, pp. 3-152, entirely in the Chippewa language and in syllabic characters. Of the bishop of Moosonee, the Right Rev. John Horden we shall learn more in Chap. LXVIII. His collaborator, the Rev. John Sanders, was an Indian clergyman in Bishop Horden’s diocese. BY a strange chance, if chance it may be called, no schooling was required to make religious books intelligible to a great number of Indians. About the year 1824 Sequoyah (George Guest, Giss, Guess, 1760-1843), a Cherokee, who had often heard of “the talking leaf” of the pale faces, contrived a syllabic system of eighty-five characters, which superseded the old birch-bark picture-writing of the red man. He analysed the sounds of his intricate polysynthetic tongue, and provided symbols for a complete syllabic system by various ingenious modifications of the capital letters of an English primer. This idea was adopted and developed in 1841 by-the zealous Wesleyan missionary, James Evans (1801-46), labouring in the Hudson’s Bay region. In a few years-the Indians teaching each other-his phonetic syllabary of dots, dashes, curves, hooks and triangles became a written language among the tribes between the Hudson’s Bay and the Rocky Mountains. The first of these syllabic systems, the. still existing “Micmac hieroglyphics,” so-called, was the work of Pere Chrestien Le Clercq (1630-1695) in 1665 ; improved by Father Christian Kauder in 1866. One of the most recent is the adaptation of the “Cree syllabary” of Evans by the Rev. Edmund James Peck to the language of the Eskimo of Cumberland Sound [see below, Chap. LXXIV]. The basis of many of the existing syllabaries is the Evans syllabary. This syllabary and modifications of it are now in use for both writing and printing, among many tribes of the Algonquian, Athaab(p)ascan (modified by Father Adrien Gabriel Morice for the Dimes or Tinnes, by Kirkby and others for Chipewyan, Slave, etc. ), Eskimo (modified by Peck) and Siouan stocks. The most remarkable of all these syllabic alphabets is the well-known Cherokee alphabet of Sequoyah. This alphabet was first used for printing in 1827. and it has been in constant use since then for correspondence and for various literary purposes. Sequoyah’s invention finds its parallel in the construction of the Vai alphabet by Doalu Bukere at Bandakoro, Liberia, so graphically described by Sir Harry Johnston in his Liberia, Vol. II (1906), pp. 1,107-1,135. See Handbook of American Indians, Vol. II, pp. 510, 511. It is this system in which Bishop Horden’s Chippewa book, mentioned in the preceding chapter, and most of the following translations of the Prayer Book are printed. The Crees are the largest and most important Indian tribe in Canada. They are, as mentioned in Chapter LXVII, a part of the great Algonquian stock, and are closely related to their southern neighbours, the Chippewa (Ojibway). With both French and English they have generally been on friendly terms. The earliest missionaries in the Cree country — as in all missionary territories — were the Roman Catholics. Here it was the French Jesuits, who accompanied the French commander Pierre Gaultier de La Verendrye, Sieur de Varennes, in his explorations of the Saskatchewan and the Upper Missouri rivers from 1731 to 1742. There are in Cree three dialects: (1) the Eastern or Swampy Cree, spoken in the lower Saskatchewan Valley; (2) Moose, a variety of Eastern Cree, spoken by a small number of Indians near Moose Fort, Hudson’s Bay; (3) Western or Plain Cree, spoken from the shore of Hudson’s Bay to Lake Winnipeg, and then westward along the Saskatchewan river to the foot of the Rocky Mountains. Protestant work among the Cree Indians was begun in 1820 by the Rev. John West (1778-1845), an Episcopalian minister, and chaplain for the Hudson’s Bay Company at Fort Garry (Winnipeg) on Red river. For many years the Crees had lived then in the region called Prince Rupert’s Land, the Canadian territory lying around Hudson’s Bay .. In August, 1844, the Rev. James Hunter, later archdeacon of Cumberland, Rupert’s Land, began his missionary labours among the Crees at York Fort, Devon Station, Cumberland. He was born April 25, 1817, in Barnstaple, Devonshire, England, where he also acquired his education. He soon became to the Indians one of the beloved “white praying fathers.” From 1855 to 1865 he lived at Winnipeg as rector of St. Andrew’s Church. Most of his translations were done at Devon Station, where he was assisted not only by his wife but also by Henry Budd, the earliest convert of the Rev. John West and the first native pastor of the Cree Mission. Returning to England in 1865, Hunter was appointed vicar of St. Matthew, Bayswater, London, where he worked for many years most successfully as a ·preacher and organiser. He died there on February 12, 1881. Of great assistance to him was his wife, Jean, nee Ross, an able linguist and capable translator. Eastern and Swampy Cree are actually two separate dialects, neither of which are spoken in Saskatchewan. Eastern Cree is spoken primarily on the James & Hudson's Bay areas of Quebec, and Swampy Cree in Northern Ontario. In 1853 Hunter had printed at London a six-page pamphlet in the Cree language, roman characters, containing the Creed, the Ten Commandments and several prayers. Two years later the S.P.C.K. published for him; Ayumehawe Mussinahikun. The Book of Common Prayer. . . . Translated into the language of the Cree Indians of the diocese of Rupert’s Land, North-West America, iv, 248 pages, 16mo. Text entirely in Cree, roman characters. The initial iv pages contain title, reverse printer’s name; Key, p. iii; reverse, Remarks, signed J. H. Appended, without title-page, are hymns, translated by Mrs. Hunter, pp. 249-274. Griffiths 21:1 (1855); Griffiths states this is in the Eastern or Swampy Cree dialect. The year following the Church Missionary Society published: Portions of the Book of Common Prayer, . . . in the language of the Cree Indians of the Diocese of Rupert’s Land. (Transmuted into the phonetic syllabic symbols.) Published under the sanction and superintendence of the Right Rev. David [Anderson], Lord Bishop of Rupert’s Land. Specially designed as an aid to the family and private devotion of the Indians while at a distance from the public means of grace. London: Church Missionary House, . . . 1856. Lithographed by J. Netherclift, Sen. . . . Half-title, reverse blank; title, reverse blank (4 pages); introductory observations, pp. i-iv; Cree numerals, one unnumbered page. American Indian phonetic syllabic scheme mnemonically arranged (with more especial regard to the Algonkin dialects, particularly the Cree), two unnumbered pages. Text, entirely in the Cree language, syllabic characters, pp.1-52, 8vo. Pp. 43-52 contain songs set to music. In 1859 Hunter had published the whole Liturgy in syllabic characters, excepting the title-page, which reads [One line of syllabic characters: Ayumehawe Mussinahikun]. The Book of Common Prayer, . . . Translated into the language of the Cree Indians of the Diocese of Rupert’s Land, North-West America. [“Archdeacon Hunter’s translation.”] London: Printed for the S.P.C.K. . . . 1859. Title, reverse blank; explanation of the Syllabary, signed W[illiam] M[ason]; reverse blank. Text entirely in the Cree language, syllabic characters, 190 pages. Paper, 4 x 6½ inches. The transliteration into the Cree syllabary was made by the Rev. William Mason, of the C.M.S. The edition has often been reprinted, apparently without any change. It does not include the Psalms of David. In 1876, and again in 1877, the S.P.C.K. published editions of the Liturgy in Cree, roman characters. The one has an English title, excepting the first line; the second a title in Cree, reading: Ayumehawe Mussinảhikum, | mena | kā isse Mākinanewửkee | Kunache Kẻche Issẻtwawina, | mena | ateẻt kotuka issẻtwawina ayumehawinỉk, | ka isse aputchẻtanewukee | akayasewe ayumehawinỉk: | ussitche | David’ oo Nikumoona, | kā isse nikumoonanewủkee ảpo kā isse ayumetanewủkee | ayumehāwekumikoỏk. | Ā isse Mussinảhủk nāheyowe isse keeswā- | winỉk, akayasewe mussinảhikunỉk ỏche, | the Ven. Archdeacon Hunter, D.D. | (late Archdeacon of Cumberland, Rupert’s Land), | Vicar of St. Matthew, Bayswater, London. | [London:] . . . | 1877, iv, 739 pages. Paper, 4 x 6¾ inches. A literal translation of this title as given in Pilling, reads: Prayer Book, | and | as they-shall be-given | holy great Sacraments, | and | other. lesser ordinances in-religion, | as they-shall be-used | English worship-in: | Also | David’s Psalms, | as they-shall be-sung or shall be-read | in-the-church. | As he-has written the-Cree lan- | guage-in, the-English service-book from, | the Ven. Archdeacon Hunter | ·etc. Pp. 1-67 contain the same matter, nearly page for page and line for line, as the ed~tion of 1855, but the type is not the same. Pp. 469-739 contain the Book of Psalms. Archdeacon Hunter’s work was, primarily, for the benefit of the Swampy Crees. The territory of the Western or Plain Crees was taken care of, mostly, by the Wesleyan Missionary Society. The middle section, the Moose Cree Indians, were ministered unto mainly by John Horden, the apostle of the Hudson’s Bay shore .. The Indians here numbered, all told, about one thousand. Horden, the son of a printer, was born at Exeter, Devonshire, England, in 1828, and died in 1893. He left England in 1851, at the direction of the C.M.S., to work as a lay missionary in an extremely remote corner of Rupert’s Land. Soon afterwards he was appointed missionary to the Cree and Ojibwa Indians, with station at Moose Fort, North-Western Canada. In 1852 Bishop David Anderson visited Moose Fort and ordained Horden deacon and priest. When Rupert’s Land. was divided, in 1872, into the four dioceses: Rupert’s Land, Moosonee, Saskatchewan, and Athab(p)asca, Horden was consecrated in Westminster Abbey the first bishop of Moosonee — the Indian word for Fort Moose — on December 15, 1872. When death carne to him at Moose, January 12, 1893, he was engaged in revising his own translations and .Dr. William Mason’s Cree Bible. His literary work consists of translations of the Bible, Prayer Book, hymns and Gospel history into the Cree language;, several translations into. Saulto, the language of the Saulteux Indians — a dialect of the Chippewa language; into Eskimo, and into Chippewa proper, and other minor translations. “He was always. one of my heroic people,” said Archbishop Tait of him. In 1852 Horden had set about translating a part of the English Prayer Book. He sent the manuscript to the C.M.S. in London with the request that it might be printed, and copies sent to him by the next annual ship. Instead of printing the book, the society sent a printing press and types, with a good supply of paper, together with book-binding material, of the use of which Horden knew absolutely nothing. He determined to do his best, however, and by the spring of 1854 he issued “A portion of the Book of Common Prayer in the Cree language.” Moose Factory, Hudson Bay, 1854. Five years later, in 1859, W. M. Watts, London, printed for the C.M.S. : The Book of Common Prayer. ... Translated into the language of the Moose Indians of the Diocese of Rupert’s Land, North-West America. (“Rev. J. Horden’s translation”) (2), 361 pages, 16mo. Text entirely in the Moose dialect, and printed in syllabic characters. Soon after his arrival at Moose Fort Horden taught the Indians to read according to the syllabic system invented by Evans, which is easily acquired. In this system he printed and had printed editions of the Prayer Book, hymnals, the four Gospels, and other literature for religious instruction. In 1889 appeared: The Book of Common Prayer, . . . Together with The Psalter or Psalms of David. Translated into the language of the Cree Indians of the Diocese of Moosonee. By the Right Rev. John Horden, D.D., Bishop of Moosonee. . . . (Printed with the approval of the Lord Archbishop of Canterbury). London: S.P.C.R. . . . 1889. (3), 298; (2), 188 pages. Text entirely in the Cree language, and in syllabic characters. The Psalter has a special title-page and separate pagination. This edition omits the introductory material of the English Book (Nos. 1-8), and also Nos. 26-29, i.e. Forms of Prayer to be Used at Sea, the Ordinal, The Form of Prayer for the 20th of June, and the Articles of Religion. Archdeacon Kirkby’s work for the benefit of the Cree Indians will be mentioned in Chapter LXXI. 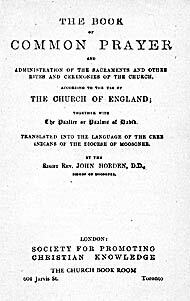 For the use of the Saulteux Indians Horden published: The Morning and Evening Services, according to the use of the United Church of England and Ireland. Translated into the language of the Saulteux Indians of the Diocese of Rupert’s Land, North America. By the Rev. John Horden, Missionary of the Church Missionary Society, Moose. [London: W. M. Watts, . . . ], 1861. Title, reverse printer’s name; text, pp. 3-36, in the Saulteux dialect of the Chippewa language, syllabic characters, except an English heading, “The Nicene Creed,” p. 35, 16mo. Griffiths 22:3; reprinted many times. THE Mikmak (Micmac) was formerly the principal Indian language in Nova Scotia. The Micmacs or Souriquois Indians dwelt in Prince Edward Island and along the adjoining coasts of Cape Breton, Nova Scotia, and New Brunswick. Few of them had any knowledge of English, nearly all were Romanists, and very illiterate. We are told by Tucker, The English Church in Other Lands (1886), p. 28, that toward the second half of the eighteenth century “the Micmac, Marashite, and Caribboo tribes of Indians were powerful and numerous, and for their instruction portions of the Prayer Book and Bible were translated into their language.” As a matter of fact, portions of the Prayer Book, translated by the Rev. Thomas Wood between 1766 and 1768, were forwarded to the S.P.G., whose receipt of them is found acknowledged in the society’s report for 1767. The manuscript was never printed. Wood was the S.P.G’s missionary in New Jersey, stationed at Elizabethtown, and New Brunswick, from 1749 to 1752. He was then transferred to Halifax, Nova Scotia, and remained there until 1763. From 1763 until 1778 he ministered to congregations at Annapolis (formerly Port Royal) and Granville, N S. He died December 14, 1778. Immediately upon his arrival at Annapolis Wood applied himself to the study of the Micmac language, and officiated in it publicly in July, 1767, in St. Paul’s Church, Halifax. In 1769 Wood spoke of “the Micmacs, Marashites [Malecite, Maliseet], and Carribous, the three tribes of New Brunswick,” as all understanding the Micmac language. The last-mentioned tribe are very probably the Abnaki, or a part of them. as one of their gentes is the Magunleboo, or Caribou. The Rev. Richard Flood was a S.P.G. missionary at the new mission established among the Munsee (Munsey) or Delaware Indians at Caradoc, on the Thames River, Ontario, from 1834 until 1846, and at the Indian mission of Munsee Town, twelve miles from Delaware, Ontario, from 1841 to 1855. The majority of the Indians at the mission were Munsees,. a branch of the Delaware nation who had come into Canada to assist the British against the American colonies. They were a remnant of those Delaware refugees from the United States, who for many years during the colonial period had been the object of Moravian care. During the eighties of the last century they lived in three villages: Munsee Town, Moravian Town, and Grand River, in the province of Ontario, Canada. Flood’s first convert was the leading chief of the tribe, Captain Snake, who was baptized in 1838. Flood’s ministrations extended also to the Potawatomies, the Oneidas and the Chippewas in the neighbourhood. [l] See further, Sprague, Annals of the American Pulpit, Vol. V. pp. 328, 329. Digest of the S.P.G. Records, Fifth Edition, 1895. pp. 112-113, 125-126. The account of Wood’s relations to the dying abbot Maillard as given in Sprague and in the Digest are stoutly contradicted in The Catholic Encyclopædia, Vol. IX, p. 539. Antoine Simon Maillard, the apostle of the Micmacs, was a missionary to the Indians in Arcadia from 1735 until his death, August 12, 1762. He was also vicar-general to the bishop of Quebec from 1740 on. He was the first to acquire a complete mastery of the extremely difficult language of the Micmacs, for whom he composed a hieroglyphic alphabet, a grammar, a dictionary, a prayer book, a catechism, and a series of sermons. A careful examination of the literary remains of Maillard and of Wood leaves no doubt as to the fact that the latter made most ample use of the former’s papers of which he took charge after the abbe’s funeral. Hawkins, Missions, 1845, p. 361. An interesting account of a visit to this mission is contained in James Beaven, Recreations of a Long Vacation, etc. (1846), pp. 68-82. The S.P.C.K. published for the missionary in 1847: Morning and Evening Prayers, the Administration of the Sacraments, and other Rites and Ceremonies of the Church. . . . Title, reverse, printer’s name; half-title, obv. of leaf 2; rev., beginning of text, pp. 2-157, alternate pages of English and Munsee; colophon on p. (158); 16mo. Griffiths 29:1; Griffiths calls this language Delaware. * Morning and Evening Prayer, the Administration of the Sacraments, and certain other Rites and Ceremonies of the Church of England; Together wit:p. Hynms. [Munsee and English] Translated into Munsee by J. B. Wampum, assisted by H. C. Hogg, Schoolmaster. [This translation is not free from imperfections, but since it has been many years in use, and there are hindrances to its immediate revision, the Archbishop of Canterbury gives his Imprimatur to this edition for present use.] London: S.P.C.K. . Colophon: Oxford: | printed by Horace Hart, printer to the University. Title, reverse blank; preface (signed John Wampum, or Chief Wau-bun-o), pp. iii, iv; contents, p. (5), reverse blank; half-title, p. 7; text, pp. 8-349; colophon, p. (350) ; l6mo. The hymns in Munsee occupy pp. 165-171; hymns , in English and Munsee, pp. 172-349. Most of the hymns were translated by Charles Halfmoon, a local native preacher. Some were by the Rev. Abraham Luckenbach (1777-1854), “the last of the Moravian Lenapists,” who ministered to his Munsee and Delaware flock on the White river, and later on the Canada reservation, from 1800 to the day of his death in 1854. With him died out the traditions of native philology (Brinton). It may be of interest to mention, in this connection, the earliest edition of Luther’s Catechism used in New Sweden (Delaware) by Swedish missionaries working among the Delaware Indians. It reads: * Lutheri | Catechismus, | ỏfwersatt | på | American - Virginiske | Språket. | [Royal Arms] | Stockholm, | Tryckt vthi thet af Kongl. Maytt. privileg. | Burchardi Tryckeri, af J.J. Genath, f. | Anno M DC XCVI. | (16), 160 pages; page, 3⅛ x 5⅞; paper, 4 x 6⅝ inches. An engraved title exhibits the picture of the divine sun-rays, with the word הוחי (Jehovah) in the centre of the sun-disc, surmounted by streamers bearing the inscription: remotis ut luceat (i.e. that it may enlighten the distant nations). A royal coat-of-arms occupies the centre of this page, and below it are the words: Catechismvs Lutheri | Lingva Svecico-Americana. | The contents are: A Catechism in the Delaware and Swedish languages, pp. 1-129; Oratio dominica lingua Virginiana, 130; Oratio dominica lingua Caraibica, 131; The Lord’s Prayer in Swedish, 132. Then follows, with special title: Vocabularium | barbaro- | Virgineo- | rum. | Additis passim locutioni- | bus & observationibus Histo- | ricis brevioribus ad linguae plenio- | rem notitiam. , ... | Anno M DC XCVI. This classified vocabulary in Delaware and Swedish covers, pp. 135-150. The book ends with colloquia (= dialogues) in Delaware and Swedish; the numerals 1-100 in Delaware, and Vocabula Mahakuassica (i.e. Susquehanna or Minqua), concluding with the numerals 1-102. This is the “Caribou” language, mentioned above. According to Brinton, Lenape and Their Legends, p. 74, the Barbaro-Virgineorum dialect was the Delaware as then current on the lower Delaware river. The Mahakuassica was the dialect of the Susquehannocks or Minquas who frequently visited the Swedish settlements. The Catechism is a paraphrase rather than a literal translation. Each paragraph of the Delaware version is followed by the Swedish “versio,” and that again by the text of Luther in Swedish, this last in larger type. The author, Johan Campanius Holm, was born in Stockholm, Sweden, in 1601, and died there September 17, 1683. He was a missionary at and near Fort Christina (Newcastle) on the Delaware, from 1643 to 1648, when his labours in New Sweden ended. Shortly after his arrival at Christina he was transferred to Upland, where he settled with his family and conducted the service at New Gothenborg, built by Governor Johan Printz. Campanius was the most important and the best known of the early Swedish preachers on the Delaware. He worked hard and diligently. He manifested a deep interest in the welfare of the Indians, and applied himself to learning their language. They often came to listen to his sermons in silent wonder. In his translation of Luther’s Smaller Catechism Campanius was assisted by Jacob Swensson, Gregorius van Dyck, and Hendrick Huygen, commissioner for the colony. The translation was probably ready in its first draft in 1648, when Campanius returned to Sweden. It was revised there, and in 1656 sent to the king for publication, together with a memorial. It was not printed, however, until 1696. The book to-day is of great rarity, only a few copies of which are known to exist. A reproduction of the engraved title-page may be found in Elihu Dwight Church, A Catalogue of Books Relating to the Discovery and Early History at North and South America, New York, 1907, Vol. IV, p. 1,697. The Ottawa are a tribe of North American Indians of Algonquian stock, originally settled on the Ottawa river, Canada, and later on the north shore of the upper peninsula of Michigan. They were driven in 1650 by the Iroquois beyond the Mississippi, only to be forced back by the Dakotas. Then they settled on Manitoulin Island, Lake Huron, and joined the French against the English. During the War of Independence, however, they fought for the latter. Some were moved in later years to Indian Territory (Oklahoma), but the majority live to-day in scattered communities throughout Lower Michigan and Ontario. It was for the Ottawas of Lower Michigan that the Rev. George Johnston, a missionary of the Protestant Episcopal Church, published: The Morning and Evening Prayer, translated from the Book of Common Prayer of the Protestant Episcopal Church in the United States of America, together with a selection of Hymns. Detroit: Geiger and Christian, Printers. 1844. Griffiths lists no texts in Ottawa. Title (also printed on the cover), reverse containing the approval of Samuel A. McCoskry, bishop of Michigan. Text, pp. 1-59, containing: Prayers in Ottawa, with English headings, pp. 1-25; 26, Letter (in English) from George Johnston to Bishop McCoskry, dated Grand Traverse Bay, January 1, 1844, transmitting the translation; the Ten Commandments, pp. 27-28; p. 29 blank. Pp. 30-59, Hymns, alternate English and Ottawa. The translator used the English alphabet in its ordinary and natural manner, as known to English readers. The translation is used at the Griswold Mission in Western Michigan. The Cheyenne are an important plains tribe of the great Algonquian family. They are divided into Northern and Southern. The Southern Cheyenne were assigned to a reservation in Western Oklahoma by treaty of 1867, but they refused to remain upon it until after the surrender of 1875. In 1892 the lands of the Southern Cheyenne were allotted in severalty, and the Indians are now American citizens. In 1900 a Cheyenne Service Book was published, entitled: Cheyenne Service Book. Compiled by Rev. D. A. Sanford, Shawnee, Okla. Churchman Press. 1900. 20 pages, without special title-page, the title on the cover. Printed in long lines. Paper, 5½ x 7¾ inches. Pp. 11 (med.) to 17 (end) contain hymns; pp. 18-20 Cheyenne words with English translation. The author, David Augustus Sanford, graduated from the University of Wisconsin in 1875, and from the Philadelphia Divinity School in 1878. He served as a missionary to the Cheyenne and Arapahoe Indians at Bridgeport, Okla., from 1894-1907. His experiences as a missionary he has published in 1911, entitled Indian Topics; or, Experiences in Indian Missions, with selections from various sources. New York. In his translation Mr. Sanford had the help of several Indians, viz., the Rev. David Pendleton Oakerhater, missionary at Etna, Okla., and the late Luke Bearshield. The Arapaho are another important tribe of the Algonquian family, closely associated with the Cheyenne for at least a century past. The name Arapaho may possibly be, as Jno. B. Dunbar suggests, from the Pawnee tirapihu or larapihu, “trader”. By the treaty of Medicine Lodge in 1867 the Southern Arapaho, together with the Southern Cheyenne, were placed upon a reservation in Oklahoma, which was thrown open to white settlement in 1892, the Indians at the same time receiving allotments in severalty, with the right of American citizenship. I am indebted to Mr. Sanford for information concerning the translation and the translators of the Cheyenne Service Book. Dunbar, Jno. B., “The Pawnee Indians” in Magazine of American History, Vols. IV, V, VIII; Morrisania, N.Y., 1880-82. The greater part of the Prayer Book has been translated by Roberts; with the assistance of the Rev. Sherman Coolidge, a full-blood Arapaho Indian; but it has not yet been printed. Griffiths lists no texts in Arapaho. A shortened form of Morning Prayer, with the Ten Commandments, translated into Arapaho by the Rev. Roberts, is available online.